Iatrogenesis Disease—Are You at Risk? Could You Develop This? Last week while doing research I discovered this new disease. The information I found amazed me but at the same time I became angry with what I found. Have you ever heard of this “disease?” It sure does sound scary doesn’t it? Is it life threatening! Is everyone in danger? Imagine if you learned that every time you drove your car you increased your chance of untimely death by 20 percent or more? Would you consider an alternative mode of transportation? 92 people are killed on United States roadways each day and 30,800 annually. The number of deaths by motor vehicles – and deaths relative to the total population – have declined over the last two decades. Perhaps it is because more efforts are made to ensure the vehicle is equipped with safety features. It may be that people are being confronted with billboards, advertisements and even classes emphasizing safe driving measures. Even police are attempting to maintain roadside safety by checking on drivers’ habits and abilities. A great deal of effort has been in place to ensure motor vehicle deaths stay as low as possible. If you learned that there are 100,000 people killed in airplane crashes each year, do you think there would be pressure on the Federal Aviation Administration to make significant changes to increase the safety of the passengers? Absolutely! Yet, today, there is no other form of transportation as scrutinized, investigated and monitored as commercial aviation. Older aircraft are being replaced, and technology updated. Pilots are only allowed certain hours to work before they are required to take a break. The aviation industry is also quick to glean what it can from any accident, improving policies and training. Over a lifetime, the chance of dying in an “air and space transport incident,” as the National Safety Council describes it, are 1 in 8,357. In other words, it is rare that even 1,000 people ever die from airplane crashes in one year. To put that in perspective, by their data from 2010, an individual is more likely to die from causes including heat exposure (1:8,321), choking (1:3,649), in an accident as a pedestrian (1:723), a fall 17,105(1:152) or unintentional poisoning 21,000(1:119). Travelers have numerous ways they can check the safety of their airline, although a good record is no guarantee of future safety. Resources including the Air Transport Rating Agency and AirlineRatings.com assess safety records and rank airlines. Travelers can also check to see if their airline is part of the International Air Transport Association, which limits membership to airlines that have passed a safety audit. The European Union also maintains a list of airlines banned from operating there because they don’t meet safety standards. What if you were told that between 100,000 and 400,000 people are killed and over 2 million people maimed and disabled every year, from modern medicine…would you believe it? A more recent study in the issue of the Journal of Patient Safety says the numbers may be much higher — between 210,000 and 440,000 patients each year who go to the hospital for care suffer some type of preventable harm that contributes to their death. That would make medical errors the third-leading cause of death in America, behind heart disease, which is the first, and cancer, which is second. The definition is: An inadvertent adverse effect or complication resulting from medical treatment or advice. Iatrogenesis can also result from complementary and alternative medical treatments or advice. What’s the exact number? Nobody knows for sure. There’s never been an actual count of how many patients experience preventable harm. So we’re left with approximations, which are imperfect in part because of inaccuracies in medical records and the reluctance of some providers to report mistakes. Measuring the problem is nonetheless important because estimates bring awareness and research dollars to a major public health problem that persists despite decades of so-called improvement efforts. We need to get a sense of the magnitude of this. Is it a disease? No. Is it a dangerous problem? Absolutely! These estimates are based on the findings of four recent studies that identified preventable harm suffered by patients — known as “adverse events” in the medical vernacular — using use a screening method called the Global Trigger Tool, which guides reviewers through medical records, searching for signs of infection, injury or error. By combining the findings and extrapolating across 34 million hospitalizations in 2007, it was concluded that preventable errors contribute to the deaths of 210,000 hospital patients annually. That is the baseline. The actual number will likely more than double, because the trigger tool doesn’t catch errors in which treatment should have been provided but wasn’t, because it’s known that medical records are missing some evidence of harm, and because diagnostic errors aren’t captured. Additional research shows hospital reporting systems and peer-review capture only a fraction of patient harm or negligent care. Perhaps it is time for a national patient bill of rights for patients. All evidence points to the need for much more patient involvement in identifying harmful events and participating in rigorous follow-up investigations to identify root causes. Members of the Institute of Medicine committee knew at the time that their estimate of medical errors was low. It was based on a rather crude method compared to what we do now. 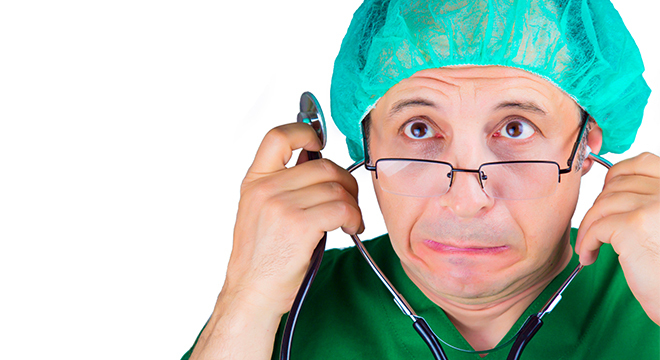 Plus, medicine has become much more complex in recent decades, which leads to more mistakes. It’s important to update the numbers from the “To Err Is Human” report because in addition to the obvious suffering, preventable harm leads to enormous financial costs. It’s time to stop citing the 98,000 number. Sadly, The American Hospital Association is sticking with the Institute of Medicine’s estimate. Eliminating medical errors must become a national priority. All the estimates, even on the low end, expose a crisis. Way too many people are being harmed by unintentional medical error and it needs to be addressed. Whether you believe the statistics are skewed, or that accidents will happen, the point of this post is that people need to realize that there is significant risk when going to get medical or even alternative treatment. Until there can be measures implemented to protect the patient—perhaps similar to what the airline industry and the motor vehicle industry have done, and to ensure truth in reporting—the chances of getting a different result than you expected is greater than getting recovery. Prevention and Care — not treatment — is the answer. Drugs, surgery and hospitals become increasingly dangerous for chronic disease cases. Facilitating your God-given healing capacity by improving diet, exercise, and lifestyle is the key. Just as important, effective interventions for the underlying emotional and spiritual wounding behind most chronic disease is critical for the reinvention of our medical care system. Wow! Excellent, informative article! Solid facts to use when discussing this problem with others. Thanks for your research. So is there a risk for taking a shot for Shingles? They advertise this on television and I am concerned because I have had those painful oozying shingles before..and hope they never return..but they say take this shot to prevent them from coming back. Is this safe to do? I was almost a victim of “Iatrogenic Disease” at least 2 times in 2016. God is good and I did not die. I went to the doctor in March and told them that I had a hernia. They ran tests and diagnosed me with a cyst in my abdomen. In May I went to urgent care with vomiting, diarrhea, and unable to eat or drink. They diagnosed me with a bowel obstruction and a ruptured appendix. Fortunately for me the surgeons did not operate and take out my appendix. They kept me on antibiotics for several days of observation and made me fast. Then they sent me home saying that my symptoms were from unknown causes. Then in July I had a repeat of the same symptoms that put me in the hospital in May. I again ended up in urgent care. This time the hernia presented itself and they rushed me to the hospital for emergency surgery for a strangulated hernia. On the day I was released, my general surgeon told me my lab tests right after surgery showed that I had a pancreatic tumor. They sent me to an endocrinologist and he scheduled me for a 72 hour fast. This fast took me down to under 100 pounds. They found that I did not have a pancreatic tumor. But I was left with many bills and the worry of anorexia as I was so thin. Praise the Lord that I was able to gain my weight back. God is the One to be praised in and through all of this. He is the One who protected me from “Iatrogenesis”. It is more real than one cares to imagine. Good article but we do still need to discover the truth about Benghazi. Too much money to Planned Parenthood could be better spent on this problem, but…,will that ever happen? Had cancer, Level-0, had radiation (I would not recommend for anyone). Went on a rubber boat down the Grand Canyon for 10 days. About the 3rd day, I was tired, weak, no appetize. After the 10 days, went to my doctor to see why my legs were swollen. No broken bones, go home and eat an Motrin ev 4 hours. The more I ate those pills, the worse my feet and legs were swelling. Finally, my feet got red, red-hot, and so painful, I was screaming until I got to the hospital. They gave me morphine – every couple of hours. My potassium was critically low; Thank God for morphine. They thought I had an infection because my feet were twice the size, hot and red. The nurse asked how bad is the pain was extreme: 1 to 10? I told her it was 50!. Shaking, shivering, and screaming. I have tears just thinking about how this pain was. So, they hooked me into some antibiotics, I got hives. They tried another one, got hives. they tried another, and I felt like ants were crawling on me and biting me! OMG, I finally told all the nurses to stop all the antibiotics and give me 3 jugs of water and I’d flush it out, whatever it was. I requested to be moved to another hospital. While waiting, I had people reading me on the phone in the hospital on Merck Manuals and we deduced this formula: Radiation+ rubber(latex) + Motrin was a recipe for an extreme latex allergy. If I had not taken the Motrin or had not had the radiation, I would not have had the latex allergy. After two days of just water, with no medication – except for morphine, my feet finally started to feel better, but the reaction was so sever, I was on a walker for 6 months and the skin on my feet were pealing like a major sunburn (worse!). Then I got a Private Trainer to get back into shape. Even the US Dept of Disease agreed, I should not have been given Motrin. Recently, my Dr. offered Shingles shot, flue shot, tinnitus shot and I declined all. I still take only 1 pill, but I only take 1/2 of it for high blood , and I’m almost ready to put that down, too. Most of the medications we take are because of symptoms of other drugs. spent. Went to another medical dr. and he said I sure didn’t need all of those medications. He took all away except 1 blood pressure pill. I thank God I prayed and he gave me the instinct to find other alternatives. I feel good. If I had kept going to the first Dr. I don’t believe I would have been here to day but God guided me.